New API from your marketing dashboard opens a window into TV impressions. TV like digital marketers haven’t seen before. API connections into digital marketing dashboards can provide multiple layers of a TV ad campaigns in one place. Just announced: a new way to combine automated, data-driven audience buying and location targeting for a unique Linear Targeted TV solution: TangoPLAN. By putting several TV options together, including network, market, hyper-local, household and against device impressions, a pivotal goal of DSPs has been achieved. By keeping the digital platform you have and adding an API it reduces investment and risk in developing access to linear TV impressions. This creates unmatched national scale by using the impact of local broadcast and the reach of cable along with a comparison to addressable and OTT to create a common ground for planning and buying for cross screen digital campaigns. Adding an independent TV API provides a window into TV inventory options for digital video planning and enables marketers to extend their cross screen solutions. 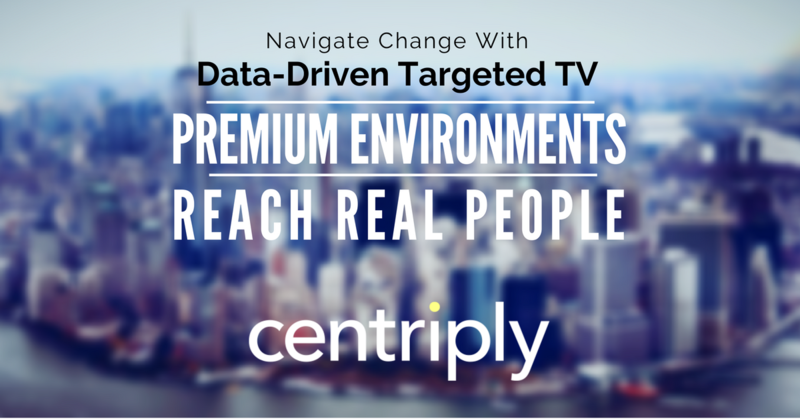 This newly expanded application is a part of Centriply's Tango Media Suite of TV marketing technology. Used in conjunction with an extensive data warehouse and powerful location module TangoGEO, any geography can be used to pinpoint target consumers at sub-DMA levels and incorporate a variety of digital data sources to inform the media planner about that consumer. TangoACT then wraps up the media buy with a powerful auto-assist function that turns out a client proposal in seconds. By applying the same audience data segments from Experian as a digital campaign, TangoPLAN lets HH level data drive Linear TV to compare viewers of broadcast and cable in one place for campaign planners. “Presenting a cohesive solution to clients that reduces waste and increases impact while extending reach, makes our solution stand out from other media agencies. Having the same audience segments as digital planners at our fingertips makes the view of the market and audience much more complete. Whether your metric is CPM, impressions or other KPIs-- it can be considered together.” says Justin Keck, Group VP of Cable Scope Inc. TangoNVIO enables the "what if's?" and gives planners a wide range of options to choose from. This intuitive platform allows planners to apply data and see opportunities available to them in order to reach their target audience while retaining the data segment values through the buying stage. "Our team of planners and buyers had a significant role in creating the functions and granular reporting ability that this platform can produce. Transparency, accuracy and the ability to go from a single ZIP to a national view was crucial to this software release. This is working today and there isn't anything out there like it" Keck emphasized. With TangoNVIO the questions of where, when and most importantly, how much to reach your audience are answered on your desktop. Take advantage of the scale and reach of broadcast and cable TV with measurable attribution and ROI. Tango Media Systems has been helping companies find their consumers with advanced TV campaigns since 2005.